Add in the coloured sashes, our wedding arch or our big Love Sign letters as extra props for your wedding ceremony hire. The Japanese Garden at the Auburn Botanic Gardens is a wonderful courtyard wedding ceremony setting. Nestled in the grounds of the Auburn Botanic Gardens the Japanese Garden is surround by lush greens and beautifully exotic flowers with the fabulous Cherry Blossom trees in bloom from August to early September. The area is filled with traditional botanic garden landscaping accompanied by the Japanese Garden themes making it a highly sort after wedding ceremony hire venue. The entrance to the Japanese Garden is through a wonderful bricked arch wall arch way which has the added advantage of hiding the bride from the guests and most importantly the groom until the start of the ceremony aisle walk. 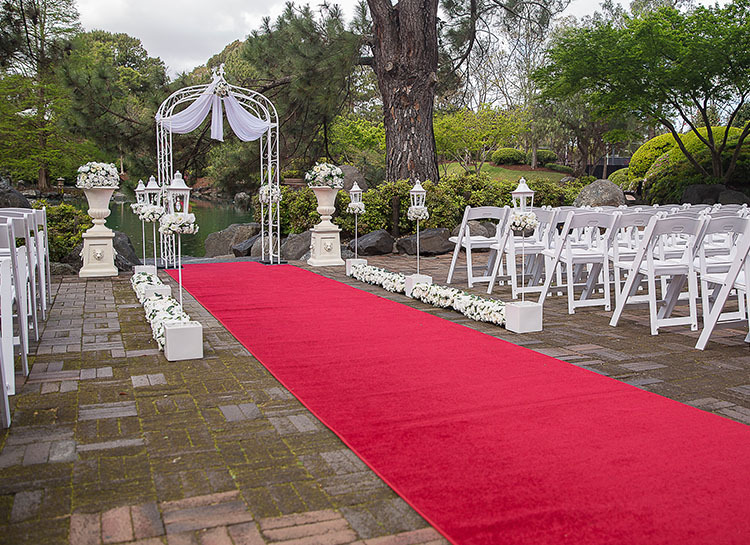 Adorable Wedding Concepts 9m x 1.5m wedding ceremony aisle runner works brilliant in this space and essentially runs the entire length from the garden arch entrance to the lakes edge where the ceremony is performed. Line the ceremony aisle with your choice of crystal lanterns, floral balls or colored bucket aisle decorations available as part of the Elegance wedding ceremony package. Either choice of ceremony aisle decorations will look spectacular with our low lying floral rose beds and create an elegant and memorable wedding ceremony aisle. At the end of the wedding ceremony aisle we position our ceremony urns and pedestals on either side of the aisle and slight back from where the bride and groom stand. Add in our wedding arch and you’ll have the perfect setting and backdrop for your ceremony. We can fit 50 wedding chairs fairly comfortably in the Japanese Garden if you are wanting to really fill the space. We like to leave space between the aisle and the guests chairs to ensure the wedding photographer has enough space to maneuver without bumping anyone or anything. More wedding chairs can be added if necessary but space can be limited and a lot of people enjoy standing for the short ceremony. The skirted wedding ceremony signing table or upgraded iron signing table and matching chairs, are placed off to the left of the ceremony aisle. Positioning the signing table here creates a great opportunity for wedding photos with the grounds and lake captured in the background. 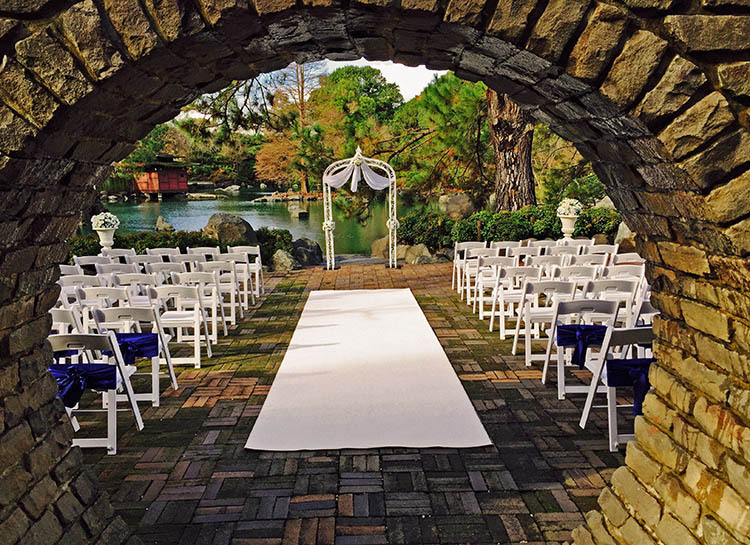 The Japanese Garden at Auburn Botanic Gardens has many features you’ll love for wedding photos including the lake, ornamental trees, waterfalls and bridge so the venue is perfectly suited for wedding hire. Wedding ceremony hire is limited in at the Auburn Botanic Gardens so get your bookings in early if you are considering this location. We look forward to hearing from you, either call 0418 624 225 or go to our enquiry page and send us an email for an obligation free quote and consultation. Unsure about the Japanese Garden as a venue? Contact us to discuss the style of wedding and type of venue you are looking for and we can provide you tips and insights from our 15 years of experience in the wedding ceremony industry. What you need to know: Auburn Botanic Gardens allow 1 hour setup prior to the start of the ceremony booking time and will no allow access prior unless special prior arrangements have been made which involve additional site booking fees.